Because I have been an errant poster (which is CHANGING, my friends), I know that you are wondering: "Well, what has she been up to?" No? Okay, well, humor me. As it turns out, the answer is "not much," but as it turns out, in blogland, not much actually has to happen in order to write something. So, here goes. My last post pre-injury was, gulp, in July. About Tamale Pie. I'm so sorry. And before that, in February about...cottage cheese oatmeal pancakes. So, you can consider this a brief year in review, if you will. Sushi-making party at Natacia's, This was a first...I'd never made sushi before (and I'm not all that good at it). Wilfer (to my right) was one of my ESL students as a beginner and now is an English whiz. He taught us how to make sushi. All the best sushi makers are Hispanic. In March, J and Rob tied the knot. My cousins and loyal blog readers...love them! The highlight (in my humble opinion...but I think they'd both concur) was the cookie tableS. 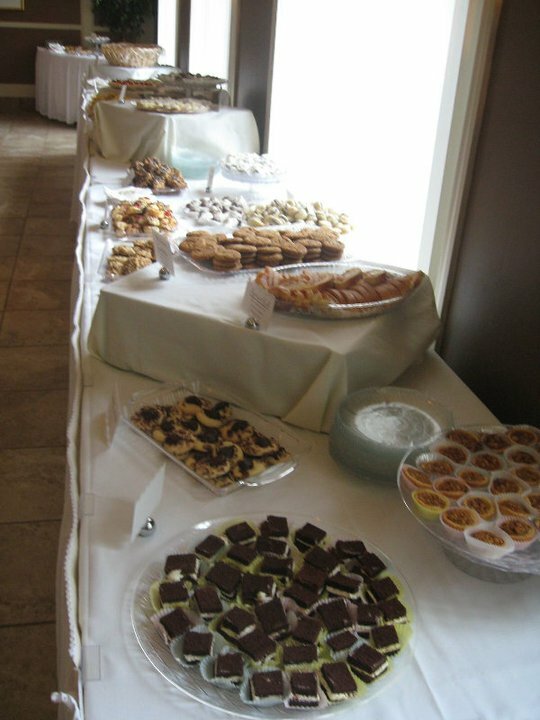 The cookie table is a Western PA tradition, and they took it to a new extreme--it was a cookie ROOM! Made by friends, relatives, and full of love! 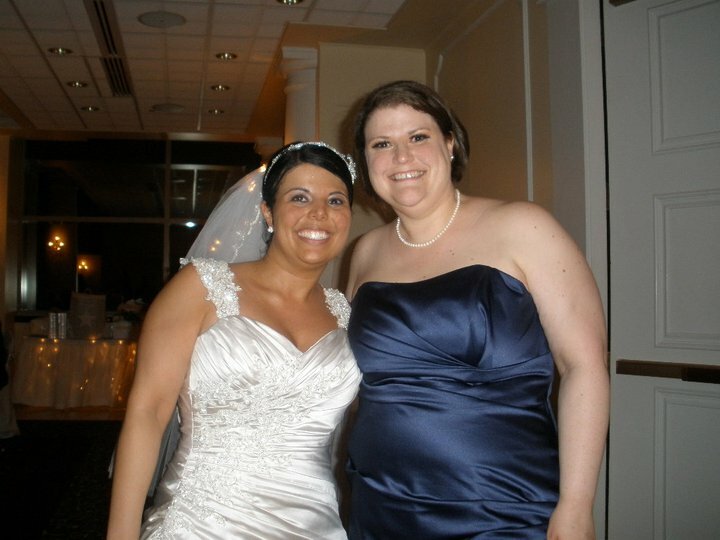 My friend Gina from high school got married in May. This marked my first time (and probably last) as a bridesmaid. It's also known as the day in 2011 that my hair was straight due to the efforts of one very committed stylist. I went on a bit of a kitchenware binge this year. I got a Le Creuset French oven (Rue La La impulse buy), a Crock Pot, and a Sodastream. The French oven admittedly got used twice, maybe three times, but now that I installed shelves in my coat closet, I have better access to it. The Crock Pot, however, got used fairly extensively. I love it! It's like my own personal chef. Now I get why people like them so much. 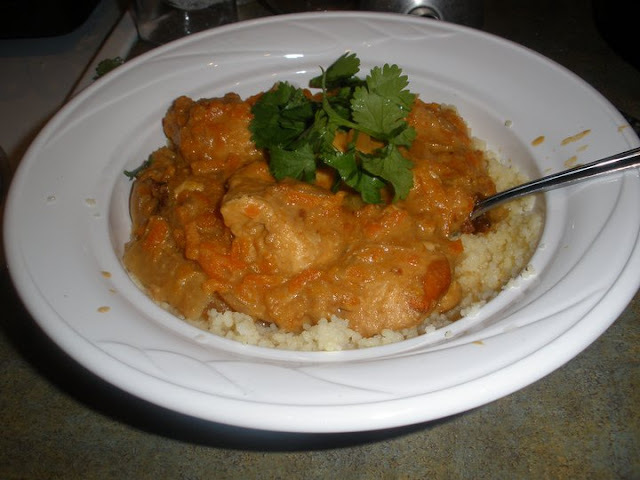 One of my favorite creations was Thai Peanut Chicken. The other thing I got was a major coups. At least in my mind. I found floor model All Clad pots on the As Is shelves at Bed Bath and Beyond. It was a wee bit scratched, but otherwise just perfect. I spent a little under $200--but the value was probably close to $400 at least. Score! I made a nice simple pot rack for them. I'll have to share that at another time! Cherry blossom time is my favorite time in the city, and this year was no exception. 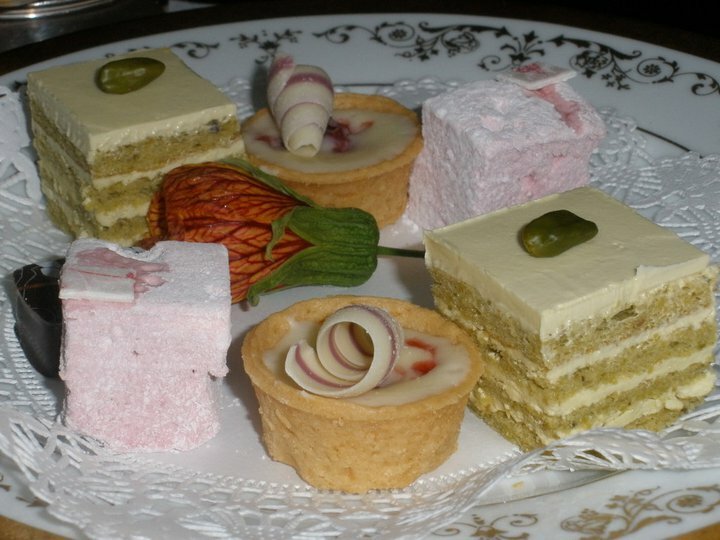 What WAS exceptional was that I went to high tea at the Willard Hotel. Lovely! I can always count on my friend Leslie to introduce me to "new" (to me) music. This year, I went with her to see Frederico Aubele at the Rock and Roll Hotel, which I'd never been to despite being within a 10-minute walk. My friend Liz and I went on a nice post-brunch walk once, and I "discovered" the Anacostia Riverfront Park. Just fantastic. I unfortunately do not have photos of the park to share, just this one of the two of us! I did a few interesting artsy fartsy things--aside from my normal Shakespeare Theatre and Washington Opera subscriptions. One was "Swampoodle" at the legendary Washington Coliseum. I can't even tell you what this was about, except that it was ridiculous and I wanted out the minute I was in. The second was "Submerge," which was a mobile walking-around-town kind of art event. It was weird, but something to do. What I remember best from that night was the stomach pains I had. Brutal. I'll continue this. No one wants one long post, including me. It's late, but you know, I'm too impatient to wait to post later. You may never see it!